Vol. 35, No. 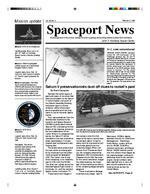 2 Spaceport News John F. Kennedy Space Center Mission update America's gateway to the universe. Leading the world in preparing and launching missions to planet Earth and beyond. February 2, 1996 (See SATURN V, Page 6) Landing date, time: March 7, 7:38 a.m. at Kennedy Space Center's Shuttle Landing Facility Mission: STS-75 on Columbia Launch date, time: Feb. 22, 3:08 p.m. from Launch Pad 39B Synopsis: The sevenmember international STS75 crew will conduct scientific investigations with both the Tethered Satellite System-1R (TSS-1R) and United States Microgravity Payload-3 (USMP-3) primary payloads during the 75th Space Shuttle mission. Beneath the seven layers of paint and years of corrosion that have accumulated on the Saturn V rocket located just south of the Vehicle Assembly Building, historians hope to uncover evidence about where each piece originated and how they came to rest at Kennedy Space Center. Four representatives from the Smithsonian Institutions National Air and Space Museum (NASM) recently spent several days at KSC overseeing the first phase of the cleaning, preservation and stabilization of the rocket. When it is completed this spring, the Saturn V will be relocated to the new multimillion dollar Apollo/Saturn V Center located near the Banana Creek Viewing Site. The preservation project and the new center are being paid for by revenues from the public visitor program at Spaceport USA. The rocket, one of only three remaining, is on indefinite loan to KSC from the NASM. The other two rockets are at the Marshall Space Flight Center in Huntsville, AL, and the Johnson Space Center in Houston, TX. Preservation work began in mid-January when the first stage of the launch vehicle was moved back about 12 feet to make room for a protective tent which was placed over the remaining stages. When contractors from Thomarios Painting, the company selected by Spaceport USA concessionaire Delaware North Park Services for the rocket restoration, began the initial cleaning, the tough task of documenting the history of the remaining stages became apparent. There is extensive damage to almost every stage, said Al Bachmeier, NASMs deputy assistant director for Collections Management. Bachmeier, Frank Winter, curator of Rocketry for NASM, Scott Wirz, museum technician, and Bayne Rector, NASM chemist, pored over the rockets three stages as the cleaning began, looking for additional clues to the vehicles origins. Serial numbers have been painted over or worn off and records scattered to national archives across the United States. Mission: NEAR expendable vehicle launch on a McDonnell Douglas Delta II rocket Launch date, time: Feb. 16, 3:53 p.m. from Launch Complex 17, Pad B, Cape Canaveral Air Station Mission synopsis: The Near Earth Asteroid Rendezvous (NEAR) will measure the composition and structure of the asteroid Eros and provide fundamental information about objects that make close encounter with Earth. 51-L crew remembered Saturn V preservationists dust off clues to rocket's past By Barb Compton Mission: STS-72 on Endeavour Landing date, time: 2:41 a.m., Jan. 20, 1996, at Kennedy Space Center's Shuttle Landing Facility THE SATURN V located near the Vehicle Assembly Building is under wraps for protection from the elements as preservation efforts are underway. KENNEDY SPACE CENTER commemorated the 10th anniversary of the Challenger accident Jan. 29 with 73 seconds of silence followed by a flyover of T-38 jets by members of the astronaut corps and the dropping of a wreath at sea by Launch Director Jim Harrington. A similar observance was held simultaneously at the NASA Johnson Space Center in Houston, TX. The actual anniversary date of Jan. 28 was marked by observances planned by The Astronauts Memorial Foundation and the City of Titusville. In the photo at left the T38 jets fly over Spaceport USA during the Jan. 28 ceremony. For more photos, see page 3. Page 2 SPACEPORT NEWS February 2, 1996 Employees of the month HONORED IN JANUARY are, from the left: Jim Neff, Installation Operations Directorate; Kim Cochrane, Administration Office; Donna Winchell, Comptroller's Office; James Fowler, Safety and Mission Assurance Directorate; Ember Smith, Deputy Director's Office; James Shaver, Payload Operations Directorate; Peggy Parrish, Procurement Office; Mark Shugg, Shuttle Operations Directorate; Scott Colloredo, Engineering Development Directorate; and Marcia Groh-Hammond, Logistics Directorate. MAXINE JOHNSON, secretary to Launch Director Jim Harrington, was installed Jan. 13 as president of the Titusville Drove No. 183 of the Benevolent Patriotic Order of Does. Handing the gavel over to Johnson is past president Beverly Finn. The installation was held at the B.P.O. Elks Lodge in Titusville. District to develop hiring practices that include minorities. The Medalla De Oro award which Gamboa received was accompanied by a $2,000 scholarship which was presented to Albert Meza of the University of Houston. KSC played an active role in the conference, sponsoring four booths and hosting participants for the night launch of STS-72 on Jan. 11. The conference, with the theme Todays Hispanics: Opening Minds Through Science and Engineering, was held Jan. 9-13 in Lake Buena Vista. Oscar Gamboa, the Hispanic program manager for the Equal Opportunity Program Office, was recently honored by the Society of Mexican American Engineers and Scientists (MAES) for his accomplishments within the Hispanic community. Besides dramatically increasing the percentage of minority engineers at Kennedy Space Center, Gamboa has served on a Brevard County Commission task force to increase the participation of women and minorities in the county, and worked with the Brevard County School EUGENE HATTEN, JR., workforce diversity director for the Chrysler Corp., sponsor of the Medalla De Oro award, stands with winners, from left, Oscar Gamboa, Hispanic program manager, NASA-KSC; Margaret Gonzalez, publisher, GWR agency; and Keith Marrocco, Texas A&M student chapter faculty adviser. Not pictured is Richard Navarro, Northrop Grumman corporate employment director. Gamboa honored at MAES conference PRELAUNCH preparations for the Near Earth Asteroid Rendezvous (NEAR) mission have been proceeding smoothly at Cape Canaveral Air Station. In the photo above, NEAR is transported from NASA Hangar AE to the Spacecraft Encapsulation and Assembly Facility (SAEF-2) at Kennedy Space Center on Jan. 25. There the spacecraft was scheduled to be fueled with its control propellant, the solar arrays attached and the mating to the solid propellant upper stage completed. At the left, the second stage is hoisted onto the gantry at Launch Complex 17 in preparation for mating with the Delta II first stage. NEAR is scheduled for launch Feb. 16 at 3:53 p.m.
John F. Kennedy Space Center Spaceport News The Spaceport News is an official publication of the Kennedy Space Center and is published on alternate Fridays by the Public Affairs Office in the interest of KSC civil service and contractor employees. Contributions are welcome and should be submitted two weeks before publication to the Media Services Branch, PA-MSB. Managing editor. . . . . . . . . . . . . . . . . . Lisa Malone Editor. . . . . . . . . . . . . . . . . . . . . .Barb Compton Editorial support provided by Sherikon Space Systems Inc. writers group. USGPO: 733-096/20014 Page 6 SPACEPORT NEWS February 2, 1996 Saturn V. . (Continued from Page 1) number immediately upon poking his head into the doorway. NASM belives the module was originally part of boilerplate series 18, created for swing arm and umbilical tests at KSC. That boilerplate was taken apart and used as part of boilerplate series 30 which was created as a backup for Apollo 6. The first step in the preservation is a pressure cleaning with a disinfectant and a general cleaning solution to remove mold and mildew. The next step is to spray the rocket with a baking soda mixture a method known as Armex. Bachmeier said it is the first time the Smithsonian has used such a method for a museum object but that it seems to work well except for the extremely damaged areas. Most of the damage appears to be corrosion of the aluminum skin from salty air and humidity. But paintings every three years with oil-based enamel have provided some protection from the elements, he said. Once the pressure cleaning and the Armex process are complete, the vehicle will be cleaned with deionized water to remove chlorides and contaminants. The cleaning, which began in the middle of January, was expected to last three weeks. Then the vehicle will be painted with an industrial quality polyurethane paint to match the Apollo 11 color scheme which was selected for the project by NASA and NASM. The Saturn V will be transported to the new facility sometime this spring and final touch-ups will be completed in the new building. The 363-foot-tall vehicle is the largest artifact ever restored for NASM and the only Saturn V rocket to be placed in a controlled environment for preservation. Anyone with any information on the vehicle is encouraged to contact Scott Wirz at 301-238-3149; Frank Winter at 202-357-2828; or Carol Cavanaugh, the KSC project manager for the Saturn V rocket preservation and stabilization, at the Public Affairs Visitor Center Branch, 867-2363. When the Saturn V vehicles were no longer needed after Skylab was launched in 1973, records were deposited in national archives facilities. Although paperwork exists to accompany each piece of the hardware, much of it is inaccessible because of the volume of material it was deposited with. Hardware was in such demand after the success of the program that it wasnt uncommon for components to be split up and sent to different locations. Although the Smithsonian representatives have been able to piece together details on the origins of the KSC vehicle, they are eager to receive any additional information to better document where the pieces came from. They have been able to provide this accounting of each of the stages and its known history: Stage 1 The S-IC-T first stage booster is a ground-test vehicle. It is believed to have come from the Marshall Space Flight Center. NASM is interested in finding out what happened to this stage between the time the testing program was completed and its arrival at KSC in the mid-70s. Stage 2 NASM believes the second stage (S-II) was from the vehicle intended to launch Apollo 18, which was cancelled. They have had difficulty in confirming this, however, because there is no evidence of a serial number. Stage 3 The third stage (SIV-B-500F) was originally manufactured as the third stage for the Saturn 1B vehicle and was used in facilities tests in the Vehicle Assembly Building and at the pad. The stage was later modified to meet the Saturn V third stage configuration. It was further modified for use in the Skylab program and NASM would like to learn more about some of those other uses. The command module revealed a little more of its history Wirz spotted a serial KSC HOSTED its first Community Involvement Expo, sponsored by KSC Public Affairs, the Brevard Community Center and the Brevard Retired Senior Volunteer Program Jan. 19 in the Operations and Checkout Building Mission Briefing Room. Thirty one exhibitors from across the county displayed their services and gave employees the opportunity to match their skills with community needs. KSC EMPLOYEES, guests and community leaders enjoy a preview of Spaceport USA's Payload Processing Exhibit and Launch Status Center during opening festivities Dec. 14. The exhibit features video of KSC employees talking about their payload processing roles as well as what working for the space program means to them.